Hello my dear readers! 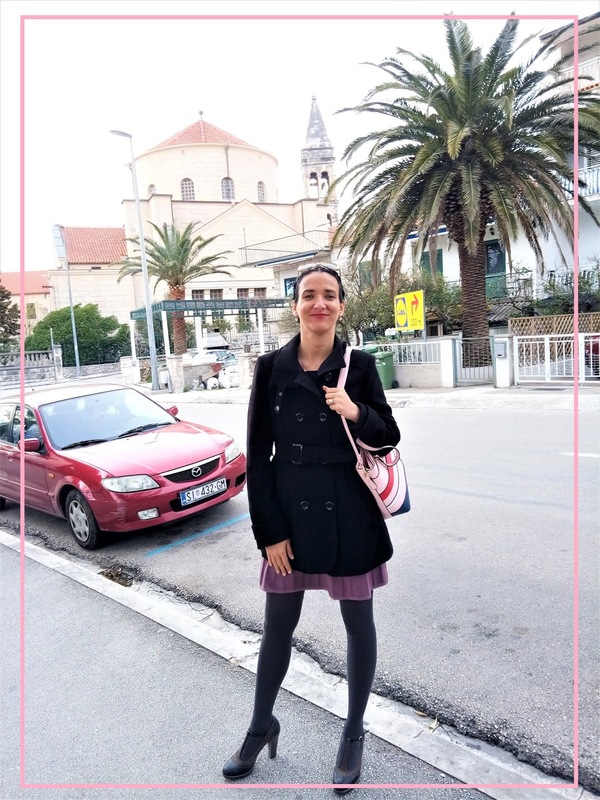 Today I'm back with another post from Makarska city, a very popular coastal touristic destination in Croatia. 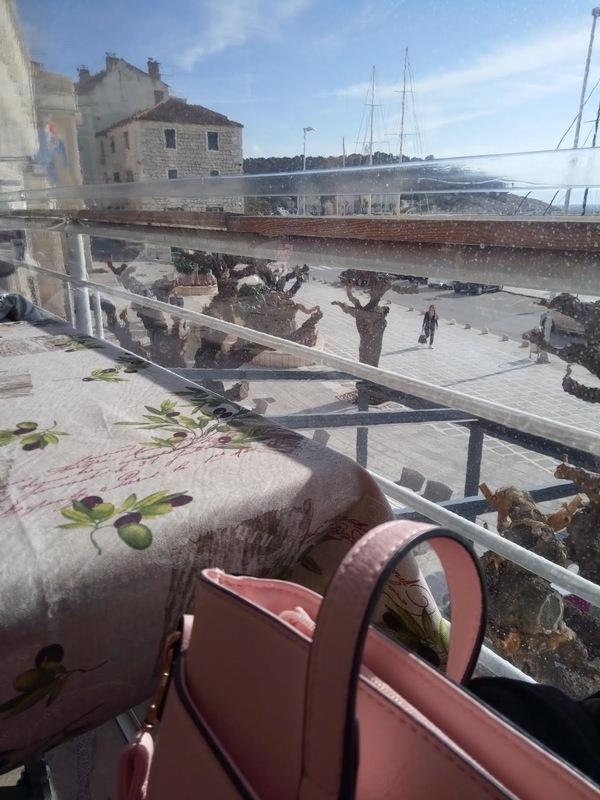 If you remember, I went to Makarska on the first of March to visit a family member. I went back again last Friday (exactly a week ago) and the weather was dreamy. We had a great time, we sure did. In this first photograph, you can see me standing in front of Franciscan monastery and church of Blessed Virgin. 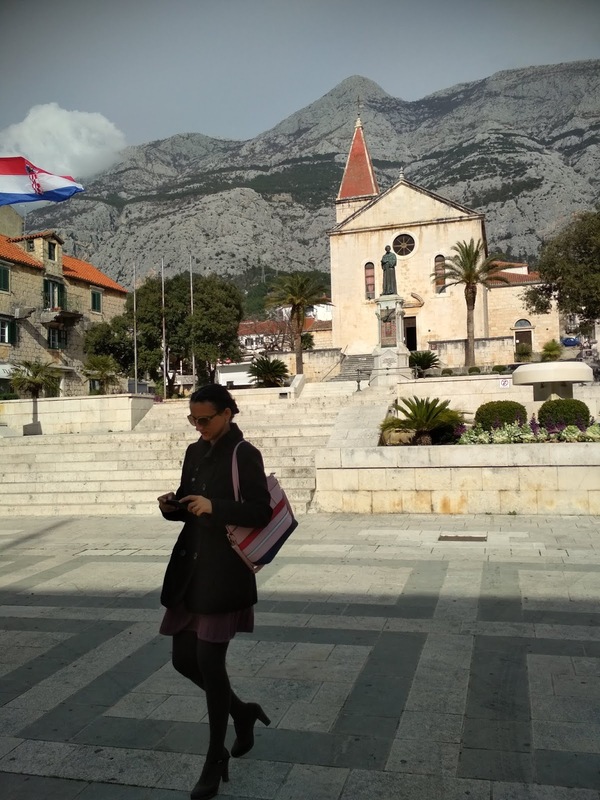 I will write a more about this monastery some other time, and today I'll show you a bit more of Makarska city itself and show some of its many attractions (like the main city square and the church of Saint Mark the Evangelist). If you haven't seen it yet, feel free to check out my recent post about Makarska. 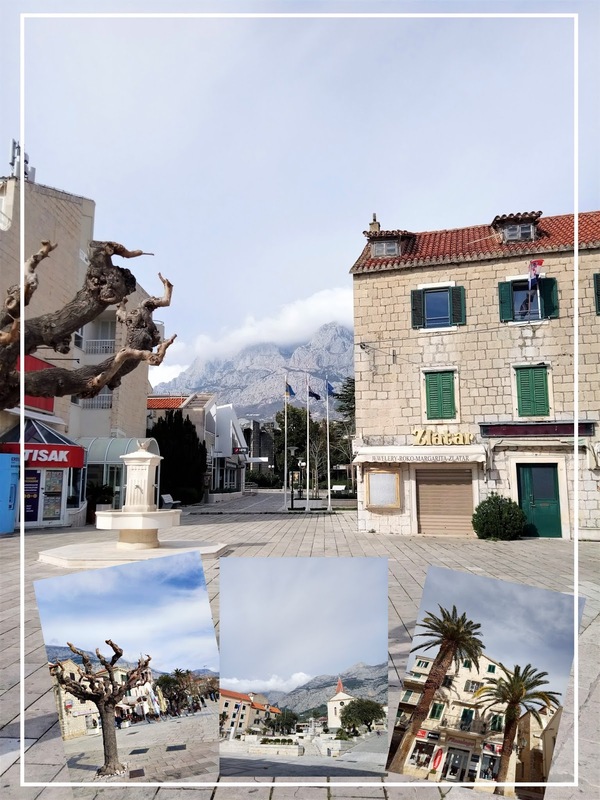 You can also check out this old Makarska travel post (dating to March, 2016). As you can see, I've been to Makarska a few times. Not nearly enough, if you ask me. It is a beautiful city and I think I even prefer it in spring season. For my outfit, I choose different shades of pink. I wore this light pink poncho top with tassels over a dark pink long sleeved top and paired it with a dust pink skirt. That's a lot of pink but I felt like rocking pink. You know as they say, pretty in pink. I also wore a pink bag. The heels and tights were of neutral dark grey and my coat was black. That was basically my outfit for the day. I felt like dressing up a little. These heels are quite high, but they are comfortable nevertheless. So, it was a good styling option for me. Do you like pink clothing items? Do you feel pretty in pink? I might wear it more this spring. Introducing lighter colours is a great way to give our outfits a more spring feeling, even when it is still a bit fresh outside. You can also rely on materials. Crochet, lace and tassels can create that spring/summer vibe and festivals in the open. 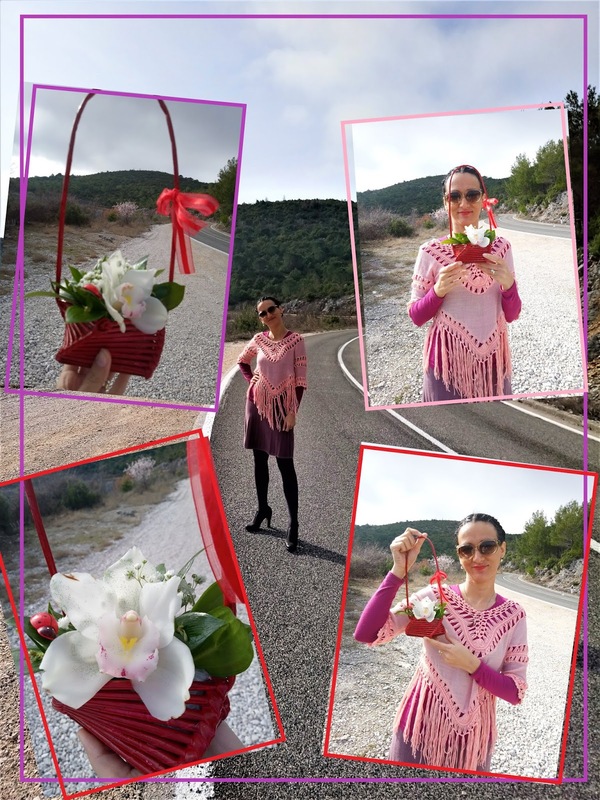 I bought an orchids flower arrangement for my family member in a local flower shop here in Mostar and she liked it a lot. I think it looks pretty cool. I was thinking of roses, but I choose an orchid instead because it seemed more original. Orchids are magnificent flowers, aren't they? They do have an exotic charm and delicate beauty to them. I also liked the way this flower arrangement was placed in a small red basket. I saw these kind of flower arrangements before and I think they make a good alternative to flower bouquets especially if you're visiting someone in a hospital or a hotel and you don't want the flower arrangement to take too much space. 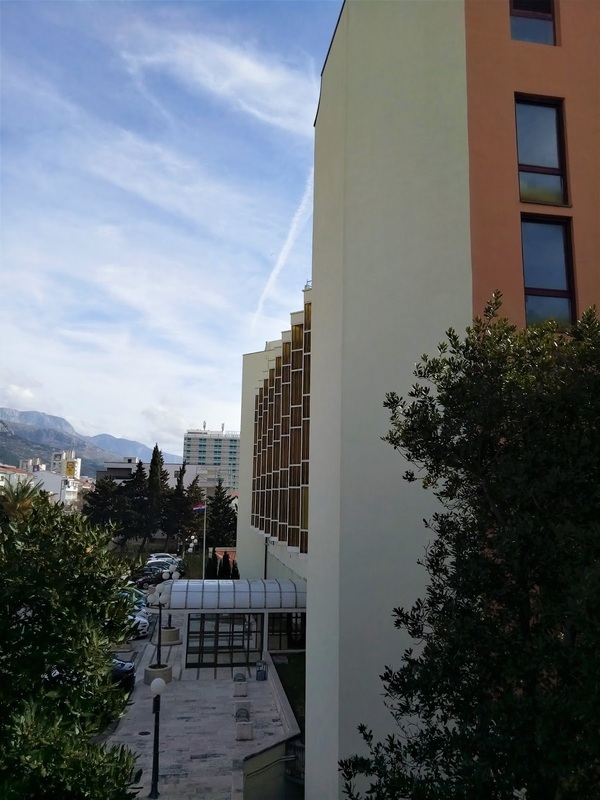 As soon as we arrived to Makarska, we went to Biokovka hotel to meet up with my family member. She was very glad to see us and we had a nice time catching up. She is very content with the service in the hotel, the staff and everything. That's very important because she is there for health reasons. Biokovka is a hotel that specializes in heath tourism, and she herself was sent to this hotel by her doctor for rehabilitation purposes (she is recovering from a stroke). It puts my heart at ease to see her content. The hotel is so lovely. I was worried it will be one of those hotels that seem to be left in the socialist era, but the rooms and lovely and the views are beautiful. 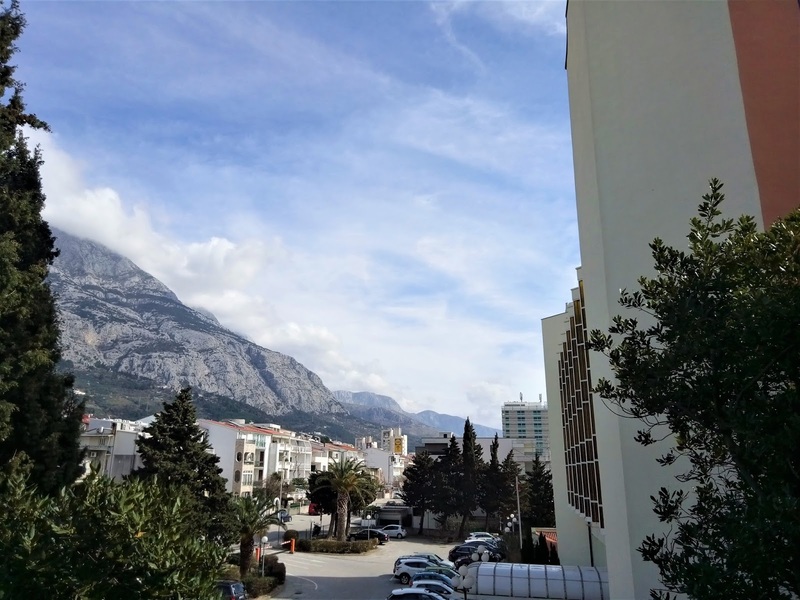 Once again, we went to Makarska in the company with our friends, so when we left the hotel, we went for a stroll with them and enjoyed the sunny day. Makarska sure looked beautiful. There is always something calming about spending time by the sea, especially when the beaches are this gorgeous. 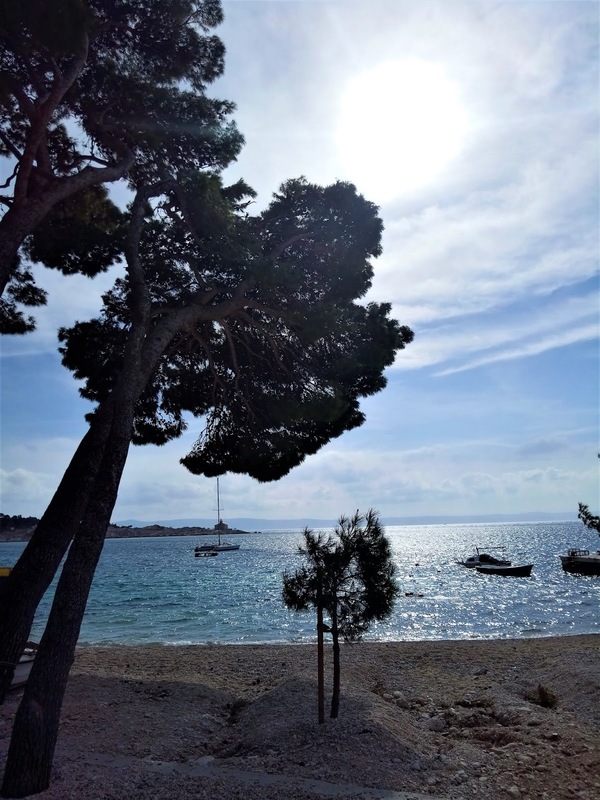 It is the beaches that Makarska is probably best know for, and rightfully so because they are truly beautiful. However, the beaches themselves are not the only thing worth checking out. The city itself is wonderful. 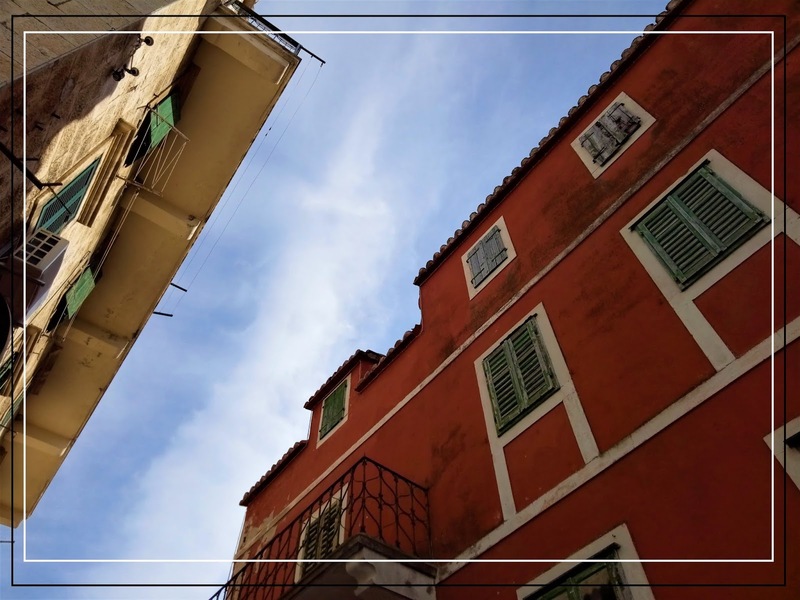 Simply perfect for strolling around and resting your eyes on beautiful historical buildings and houses. If you keep your eyes open, you'll notice many lovely details. We asked for recommendations from locals and they directed us to restaurant Timun. It is easy to find as it is located right next to the main promenade. My friends all had pizza but I ordered bruschette for myself (see how I like to prepare them here). The dish was alright, but nothing special. I don't like that they didn't cut the onions, that to me is a whole point of this dish, to have the flavours mix. I did also ordered the dessert (an orange cake) and that was delicious, but if I remember well also a bit pricey. Would I dine in Timun again? Yes, why not? The view from the terrace is amazing and the staff is friendly. The food doesn't seem like anything special, but not bad either and location is great, so I might revisit. We spent a few minutes in front of church of saint Mark the evangelist but we didn't go in this time. 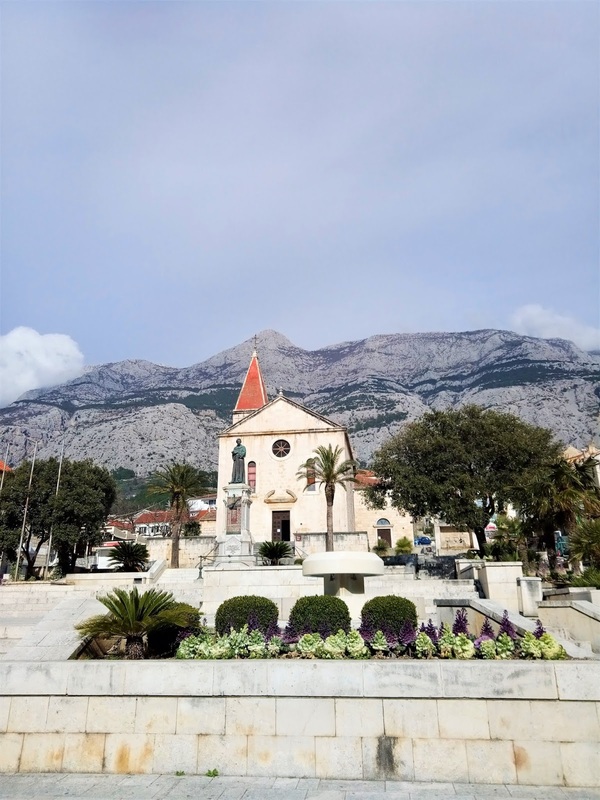 This beautiful baroque church is actually Makarska's Co-cathedral. It used to be a cathedral in Archidiocrese of Split Makarska. This lovely former cathedral was build in 1700 but it wasn't used and finished until 1756 when it was consecrated by a Bishop of Makarska. 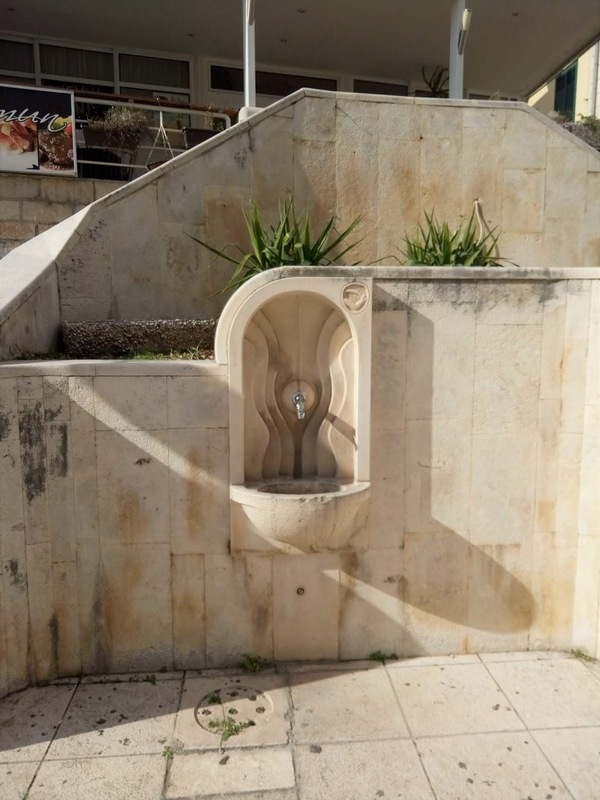 You can find more information about it and the Friar Andrija square here. In front of the church, you'll also be able to see the statue devoted to the man this square was named after. 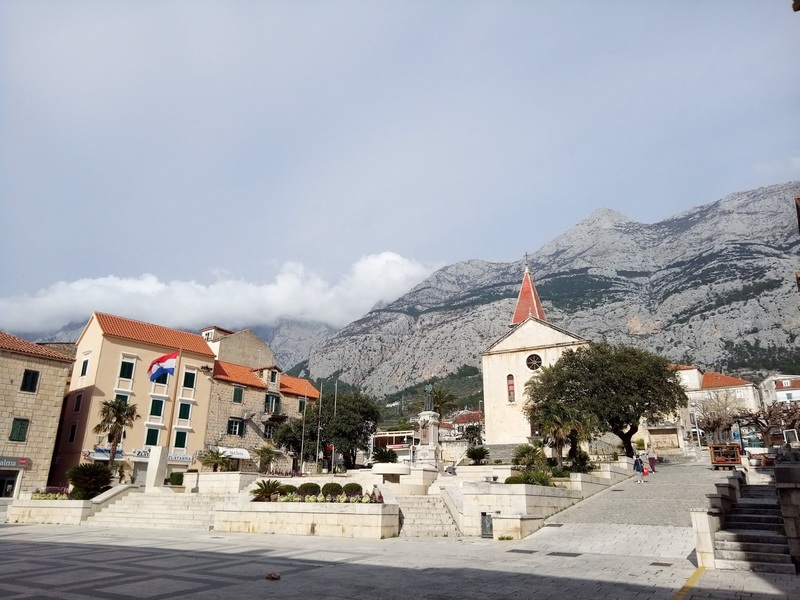 The city's main square is named after a friar Andrija Kačić Miošić (born in 1704, died in 1760) who was a talented writer/poet and a very interesting historical person. With his writing, Andrija aimed to spread literacy and modern/progressive ideas among common people. Descended from one of the most notable Croatian noble families, he worked hard on the education of the commoners. Wise as he was, he drew heavily on Croatian folk oral tradition to make his writing more accessible to common people. I had to study and read quite a lot about him back in the day because (as some of you may know) I studied Croatian literature and language but I didn't mind because it was all really interesting. In the city square, you can also see a statue devoted to Andrija Kačić Miošić. This statue was erected in 1890 and paid by Croat people, but the government in Vienna (these were the day of the old Empire) wasn't too found of that because they saw it as a sign of awaken desire for Croatian independence so they forbade it and the statue wasn't finished until much later on. But all is well that ends well, right? Looking for more Croatian destinations recommendation? 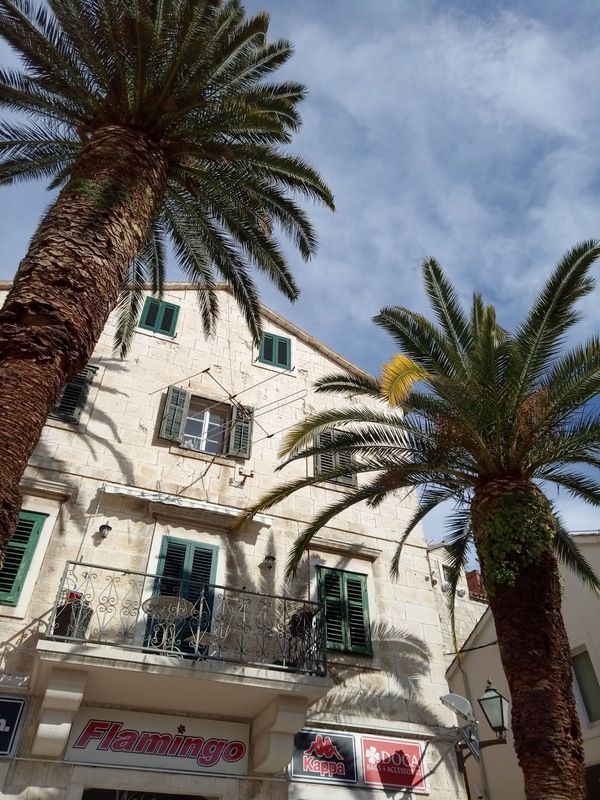 Check out my travel post about Split, Jelsa, Starigrad, Šibenik , Zagreb, Zadar, Drvenik and island Visovac. That would be all for today. As always, thank you for reading. Have a lovely weekend! the view there is really nice. such an underrated place to visit!! So lovely! The weather looked perfect, too. Love the faded splendour of the buildings and the clouds over those majestic mountains. 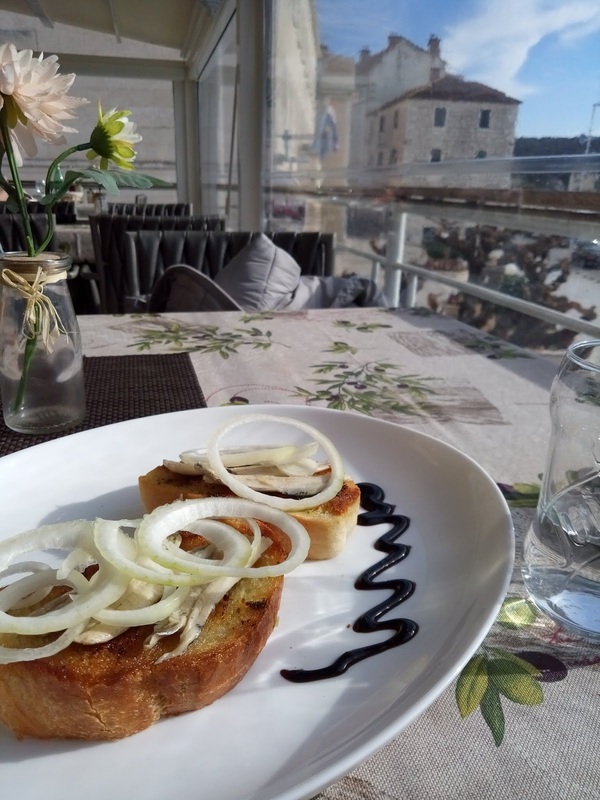 Those sliced onions on your bruchetta are so wrong , like an afterthought as opposed to part of the dish. Thank you, I do enjoy seeing clouds over mountains, makes them look even higher somehow. The sliced onions did seem wrong, they should have been chopped finely. Not an expert on this dish, but this much I do know. Looks great! I would so visit Croatia and enjoy it the fullest! So much FUN! Thank you Lyosha. I hope you'll get the chance to visit some day. I love pink too I guess I many times am a pretty in pink too ah! Your poncho id really cool, and how lovely is the orchid you offered to your relative. Love to know a bit from Croatian history and about that city, I love beach cities just like my city. Woow! Lovely place and so cool outfit dear! che belle foto! un giorno devo visitare Makarska assolutamente. 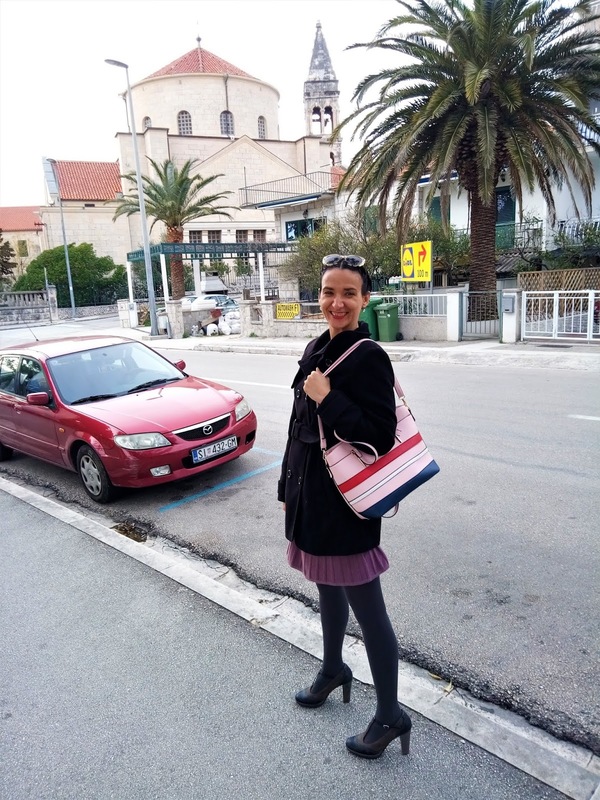 grazie, Makarska e' una bella citta per visitare. Amazing place! The mountains and the sea. We can't ask for anything more in a location! The pink is so pretty! It is the perfect color to lift someones mood. That was a great idea to buy an orchid instead of other flowers. They are so unique and beautiful. yes, the location is pretty amazing. Orchids are somehow more unique, aren't they? I love roses but sometimes it is nice to try something different. 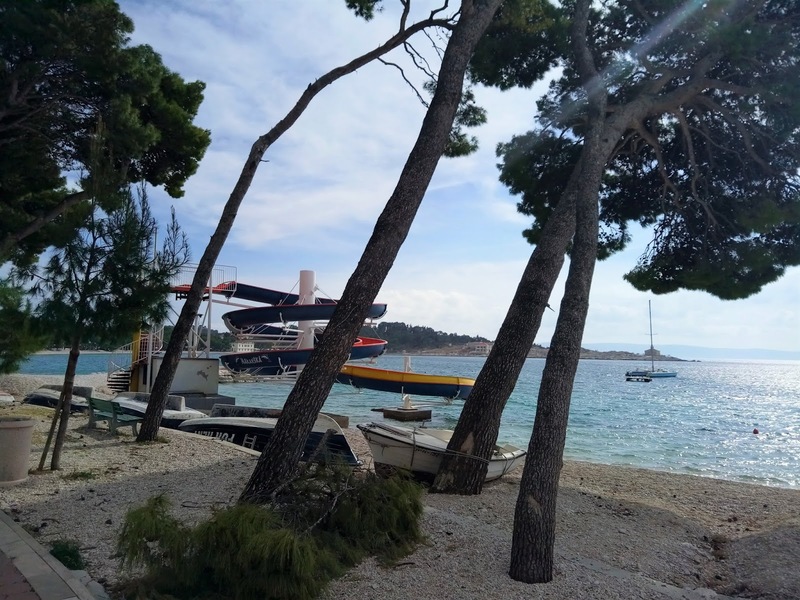 Dear Ivana, thank you for sharing another obviously very beautiful spot in Croatia! Makarska City is amazing and I understand you enjoyed your time there. How good the hotel in which your family member stays due the health reasons was not the way you feared. And I was a fantastic idea to buy the orchid. You look wonderful in your look with the pink shades - simply as the spring itself! The city looks like a beautiful place to visit! Love the outfit in your first picture! You look gorgeous! Che bello viaggiare con te per la Croazia, ci fai scoprire tanti posti bellissimi! E quanto stai bene in queste foto, troppo bella! This is my kind of vacation! Looks so calming and relaxing. It's the perfect escape! Ma che cittadina incantevole! Piena di scorci graziosi e caratteristici, sembra un posto davvero interessante e rilassante! La tua gonna in particolare è bellissima, chic senza esser troppo impegnativa! E trovo che ti doni anche molto! Super carino anche quel cestino con l'orchidea, è davvero una bellissiuma idea per un piccolo regalo! How wonderful to meet up here and a hotel for your health. That's such an interesting idea. Yet with this view maybe I 'd feel better too? LOL!! I adore your outfit. It's only in the last couple of years have I been wearing pink. It's too bad that I waited so long. This hotel has its doctors and therapist. The therapies offered are sometimes covered by the Croatian medical insurance (for those that have it, that is). The pink outfit looks so cute:-)Great pictures! Wow! I have never been to Croatia, but it looks like an amazing place. 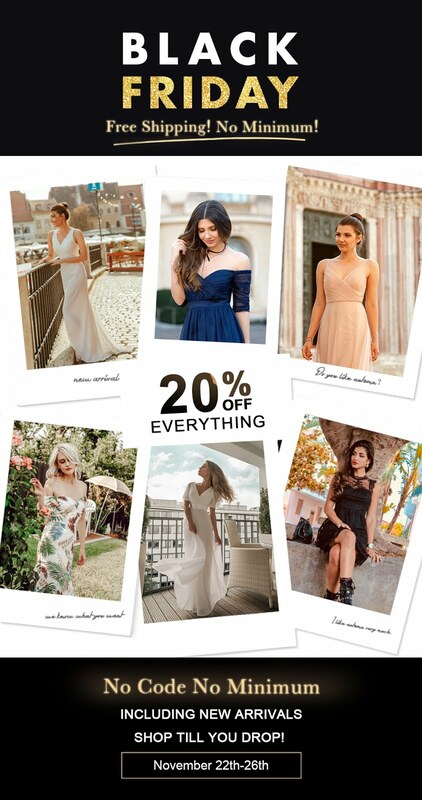 Great pics, I really like all your outfits (my favourite is the one with the poncho top). that sounds like a plan! I would love to visit Paris some day.